Feature image: 2005 Image courtesy of The Library of Congress. 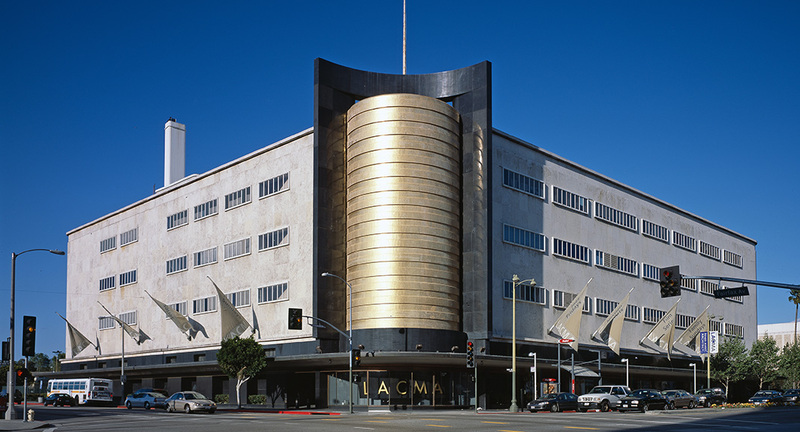 May Company Department Store Building in Los Angeles when it was acquired by Los Angeles County Museum of Art. 2017 Image courtesy of RPBW. AMMP showing the renamed Saban Building image planned for 2019 completion. 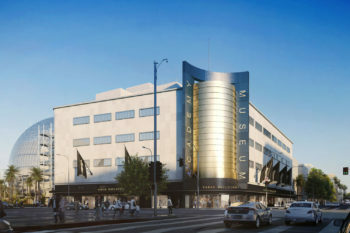 The historic May Company Building, a Los Angeles Historic-Cultural Monument, has been renamed the Saban Building in honor of a $50M gift from Cheryl and Haim Saban and is undergoing an extensive restoration and renovation to accommodate the Academy Museum of Motion Pictures, opening in 2019. Pritzker-Prize winner Renzo Piano with Renzo Piano Building Workshop and executive architects, Gensler, are reworking the Streamline Moderne-style department store built in 1939, and adding a new iconic spherical structure at the rear. The six-story Saban Building will feature 50,000 square feet of exhibition galleries, an art education studio, a 288-seat theater, a restaurant and café, public space, a store, and space for special events. Structural Focus is working with John Fidler Preservation Technology Inc. (contracted by the Academy) on the rehabilitation of the historic building’s facades. The project scope includes repair and retrofit of the existing limestone facade panels utilizing asymmetrical helical anchors. The countersunk helical anchors will be installed in pilot holes drilled through the existing limestone panels, backing grout, and concrete of the original wall construction. Since helical anchors have not been used for such an application in the City of Los Angeles before, Structural Focus and John Fidler provided testing procedures and are working with the City of Los Angeles to obtain a one-time approval for the retrofit scheme. The testing procedure mimics the same installation configuration of the helical anchors into the existing limestone panels, and utilizes prefabricated “steel shoes” to pull and push the limestone panels after the anchors have been installed, these special prefabricated “steel shoes” were used since the headless helical anchors cannot be pulled or pushed once countersunk in the limestone panels. This retrofit mechanism maintains most of the existing facade panels while providing selective repair and replacement of damaged panels. The facade restoration also extends to the repair of existing steel window boxes and flagpoles. Previous designs by others included the complete removal of the historic building’s facade. Our team’s historic restoration expertise allowed us to develop an appropriate scheme that will preserve the historic facade and meet the City of Los Angeles structural requirements. In doing so, we will not only save the historic building facade making it safe for the public but we’ll also significantly reduce project costs.